Quinoa is all the rage these days, but it's not universally loved, as The Washington Post recently wrote about. I'll admit to finding the healthful grain a bit dull sometimes, but I was determined to find a way to make it shine for Thanksgiving dinner. The flavor of quinoa ranges from almost nothing to a bit bitter. It's biggest selling point is its texture: adding a bit of crunch. To play off its strengths and make up for its weaknesses I wanted a dish where its blandness would be outweighed by richer savory and sweet flavors, but its texture would provide a welcome counterpoint. I hit on parsnips as the perfect vegetable counterpoint. Although far less popular than its root vegetables cousins the potato and the carrot, parsnips can hold their own even in a dessert. Let's be honest: they're awful raw, but roasted until they start to brown and they develop a nice toasty sweetness. 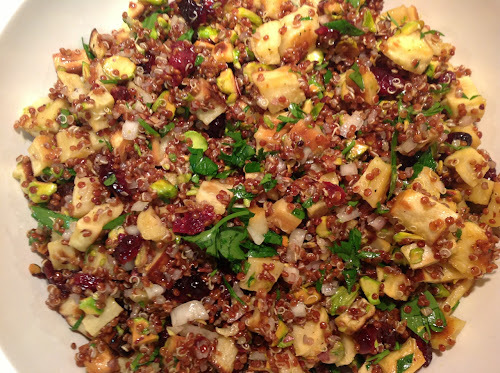 Playing up the sweet and the crunch, I also tossed in dried cranberries and chopped pistachios. To pull the flavors together with something sharp, I created a lemon-shallot vinaigrette. This dish is attractive and tasty and, as a cool dish, lends some nice variety to meal dominated by hot sides. 1. Preheat oven to 400 F. Spread parsnips on a baking sheet. Toss with olive oil and seasoned salt and roast until the parsnips are cooked through and browned on some sides, about 30 to 40 minutes (stir with a spatula halfway through). Allow to cool. 2. Put quinoa in a mesh strainer and rinse, then submerge in water and soak for 15 minutes. In a medium saucepan, bring 1 cup of water to boil, add quinoa, cover pan, reduce heat and simmer for 15 minutes. Remove from heat and leave covered, allowing quinoa to rest another 5 minutes. Remove lid and stir. Allow to cool. 3. Make dressing by whisking together shallots, olive oil, lemon juice, salt and pepper in a small bowl. 4. In a large bowl, combined roasted parsnips, cooked quinoa, chopped pistachios and dried cranberries. Add dressing and toss to combine. Serve topped with chopped fresh parsley. Rinse quinoa then soak for 15 minutes. Drain. Bring 1 cup water to boil, add quinoa, cover, reduce heat to simmer. Simmer 15 minutes. Remove from heat and allow to rest 5 minutes more. For me, this was the sleeper hit of our early Thanksgiving dinner. The fact that it's cool made it stand out, and the parsnips really enlivened the quinoa.